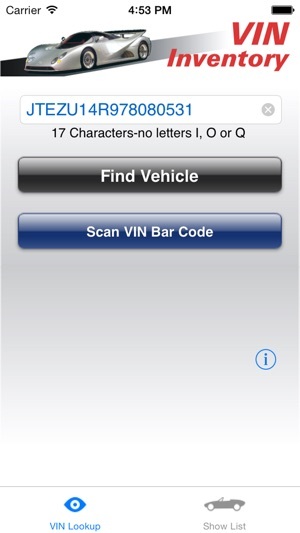 VIN Inventory is a quick VIN lookup tool that allows you to save your vehicles’ details and photos. Scan a VIN barcode in just a few seconds using the autofocus camera on your iPhone 4S and newer. Or enter the VIN using the keyboard. 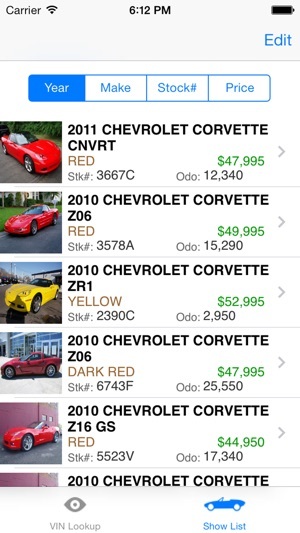 This app was created for automotive professionals such as dealership managers and salespeople, as well as car enthusiasts and anyone who wants to keep a list of vehicles with photos. No subscription, in-app purchase or decoding fee is required to use the full features of VIN Inventory. 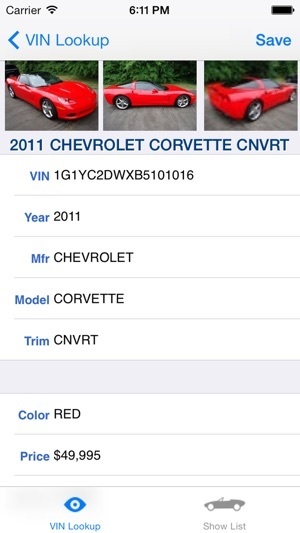 VIN Inventory quickly authenticates and then decodes the vehicle VIN (serial number) and displays rich details including year, make, model, engine, equipment and optional accessory items. 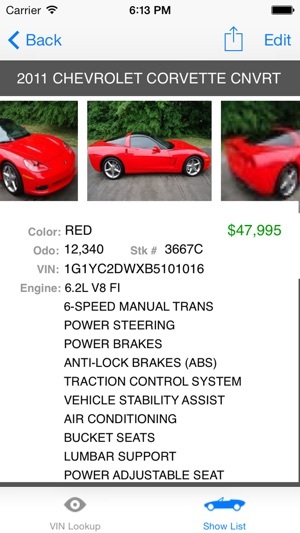 The user may add stock number (or tag number), color, odometer reading, price, and a note about the car. 3 photos can be added using the iPhone camera or Camera Roll. Equipment items can be added or changed. The user may choose to either add the vehicle to their saved inventory list or delete the vehicle after a quick review. Previously saved vehicle data can be edited or deleted from the list and photos can be updated. The Vehicle List display screen is a scrolling table of all saved vehicles complete with your thumbnail photos. You can email a text file of ALL of the vehicles in your list. Tapping on a specific vehicle causes a Detail View to be displayed with vehicle specifications, equipment options and vehicle photos. 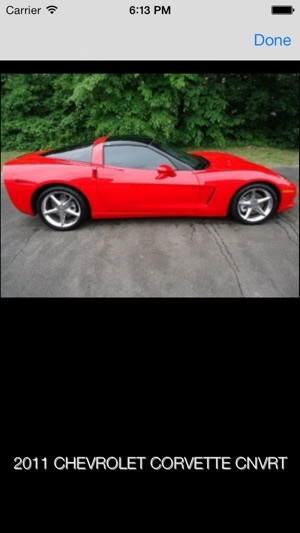 Tap on a photo to see an enlarged image of the vehicle. Send an email of a single vehicle that includes all of the vehicle info and 3 photos. VIN Inventory accepts vehicles produced after 1981 (17 digit VINs). Data coverage is for North American vehicles and omits data for exotic vehicles and older vehicles that are not commonly found on dealership car lots. AutoPlus produces other vehicle inventory tools with such features as upload, download, import, and export of vehicle data, multiple photos, label printing and other powerful functions. It’s a great app. It would be great if y’all can add like a search bar to search for a car. And connect it to iCloud so I can save my data to there just Incase. If you want to be the average car salesman don't buy it. But if you feel you want to exceed your expectations then this is the app for you. It works great an helps you be more organized and be and feel more professional in front of your customers. I recommend this app to anyone who is always looking for ideas in how to improve themselves in the industry. The app is good but can you please add a search feature so you can either search the vin or stock number. If you have a lot of vehicles in the database it takes a long time to scroll through the list of vehicles to find the right one. Also maybe add a "date added" field and be able to search that info as well.